When I decorate cakes for events, I usually use Marshmallow Fondant. I use MM Fondant because it has the same smooth finish as traditional fondant but it tastes much better and is very inexpensive! If you’ve never made or used fondant, it ca be a little tricky, so I’m sharing a two-part tutorial on how to make MM fondant and then how to decorate with it. Last week, we looked at the making of MM fondant, so this week we’re learning how to decorate with it! Enjoy! If you missed the tutorial on how to make MM fondant, check it out here. Now that the fondant is all colored and ready to go, we need a cake. This amount of fondant will easily cover an 8, 9, or 10 inch cake with some to spare. If you are covering a tiered cake (let’s say an 8-inch and a 6-inch cake) you will likely need and additional half batch of fondant. Today I’m decorating an 8-inch square cake. Now it is time to measure your cake. Even if you know your pan sizes (my cake is two 8x1.5 inch square layers stacked on top of one another), always measure with a ruler to verify (my ruler is pretty snazzy, eh?). In this case, my cake is 3 inches tall by 8 inches wide. Now it is simple mathematics. Always (for square or round cakes) take your width and add the height twice (or W + 2H). For my cake this looks like: 8 + 3 + 3 = 14. Therefore, when I am rolling out my fondant, I need it to be at least 14x14 inches (I roll out a large circle regardless of the shape of my cake. And it is not usually perfectly circular, more nodular). I usually add an additional inch or two, just to be on the safe side. For this cake, I actually rolled out a 16x16 inch circle, about 1/8 inch thick. I always roll out my fondant on a thin fondant rolling mat that has been very lightly dusted with corn starch. It is marked with sizes and is flexible enough to be flipped directly onto the cake and peeled off. If you do not have a mat that can be used for this purpose, dust the surface of the fondant with corn starch and gently roll the fondant onto a rolling pin, carefully unrolling the fondant onto the cake. Also use this second method if you need to roll the fondant larger than your rolling mat. If you notice any air bubbles as you roll, insert a toothpick into the bubble and press down on the bubble to release all the air. Continue rolling as usual. Using the palms of your hands or a fondant smoother, gently smooth the fondant over the top of the cake, starting at the center and moving to the edges. Then move to the sides. Smooth the fondant along the sides of the cake, taking care that the fondant is flush against the cake, especially near the bottom. At times, the fondant may wrinkle (this will specifically happen at the corners on a square cake, but will occur on round cakes as well). To remove the wrinkle, gently pull and stretch the fondant to cover the area and smooth down. Use a sharp knife or pizza cutter dusted in corn starch to cut away the excess fondant. Smooth down the sides with a fondant smoother. Now the cake is covered! 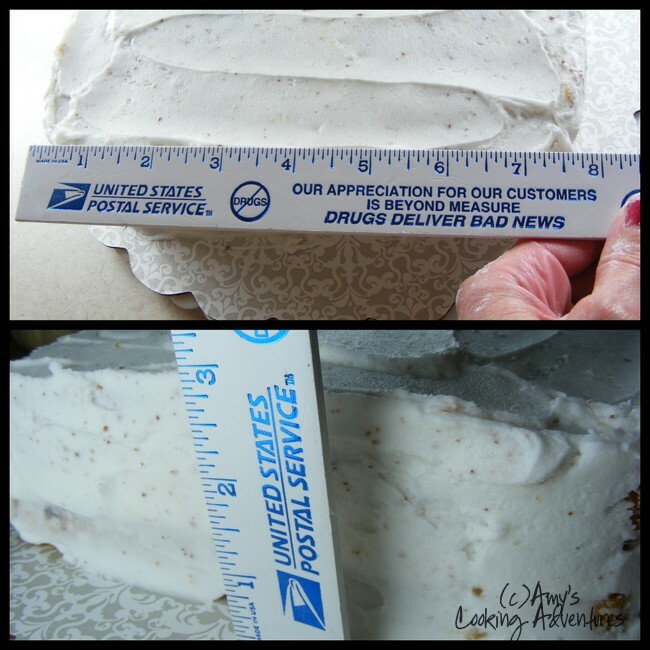 Add any details and borders using fondant or buttercream. How did you get the fondant decorstions to stick on the top? I have seen shortening and water, but I don't know if there is a difference etwwen mf and what could be purchased. Thanks! Thank you. This is a great tutorial. I've only used this fondant a few times and it addresses the issues I have run in too. Hi Kelly - I've never made a Chanel cake, so I'm afraid I'm not much help. I recommend trying Youtube with your question. Good luck! Have you ever used marshmallow fondant to cover a rice crispy treat cake? Should I still use the Buttercream layer or would that not be necessary since there's no crumbs? What is the best mat to use for rolling - a recommendation for a specific type or brand would be greatly appreciated! I have a Wilton mat that I'm happy with. It's the only one available locally, so that's what I use!